“What perfume are you wearing? It smells great!” – I asked a flight attendant on my way to Maui. He seemed pleased by the question and told me that it was a custom blend made for him “by this great lady from Oakland.” He also told me that it was a very potent and tenacious perfume oil (“because it’s all-natural, you know“) that required only a tiny drop of it (he wore it on the neck below the collar line) to last for many hours – to that I can attest: I kept smelling it every time he would walk by. Later he brought me a note with the perfumer’s name and phone number. The scent was beautiful amber – completely wrong for Hawaii but perfect for the chilly flight. We landed and the summery tropical atmosphere took my mind off ambers and fall on the calendar. As we were driving to the resort where we rented a condo, my vSO drew my attention to the words on a dashboard of our car and asked if I thought it was a sign. We followed the instructions but this time (unlike the previous Hawaiian vacation) our residence didn’t come with a ginger cat and the only feline we encountered during our vacation was scrawny black cat hunting a lizard. Choosing the right time to go to Hawaii is always a balancing game for me: I love swimming in warm ocean so if we go too late it might start cooling off (back to the temperature that most other people consider good for swimming) but if we go while water is still perfect by my standards, the weather is too hot for anything else but swimming in mornings and evenings. Last year I didn’t get to swim as much as I wanted to so this year we decided to err on the side of caution. We succeeded so to speak: we went a week earlier than we usually do; water was great but hot humidity kept us inside most of the time that we didn’t spend swimming or snorkeling. I still can’t complain: we’ve got to read, watch some shows from Netflix and just relax. And a view from our condo was very picturesque. Maui is my favorite island: its flora is more tropical than volcanic Big Island’s but at the same time it’s more developed than Kauai. The downside of the larger tourist population is a much poorer selection of tropical fruit at the local markets. But don’t worry: we didn’t go hungry. Or thirsty. 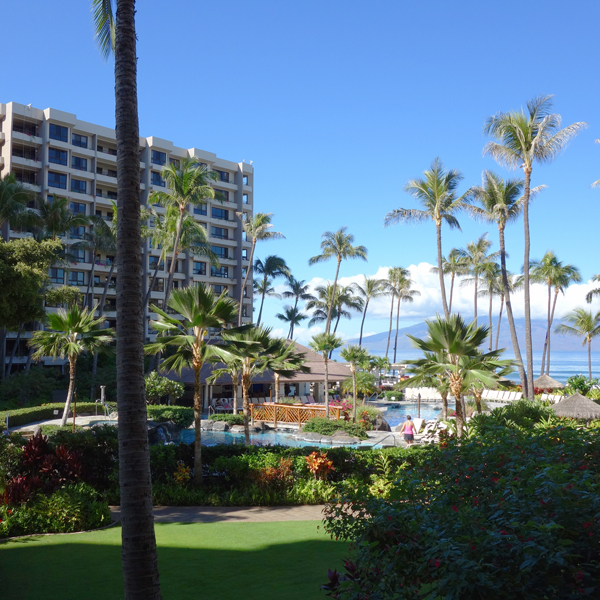 Even though we didn’t move around the island much we got enough of the true Hawaiian flavor – tropical plants and fish, ocean sunsets, tropical penguins… Yeah, I also had to do a double take when I saw them first at Hyatt’s lobby pond. But they didn’t look psychotic so after some deliberation we decided not to look further for zebra, lion and hippo. Usually when I travel I do not take any perfume bottles bigger than 10 ml. But I make an exception for my vacations in Hawaii: I always bring my 50 ml bottle of Estee Lauder Bronze Goddess. It has previously traveled with me to Big Island and Kauai and this year it came to Maui. I think I gave a hotel maid a good story about “those crazy tourists” by putting the bottle in the fridge (I noticed that the box was rotated after her visit so she was clearly surprised to see it there). It felt extremely pleasant and refreshing to spray it all over my body after taking a shower. I hope you didn’t think that I brought just one perfume for the whole week on Maui. It was a single full bottle. But in addition to that I packed some travel bottles, decants and samples. As I usually do for vacations, I didn’t bring any new scents for testing – just those that I previously wore or at least tested and thought they would be nice on a tropical island. 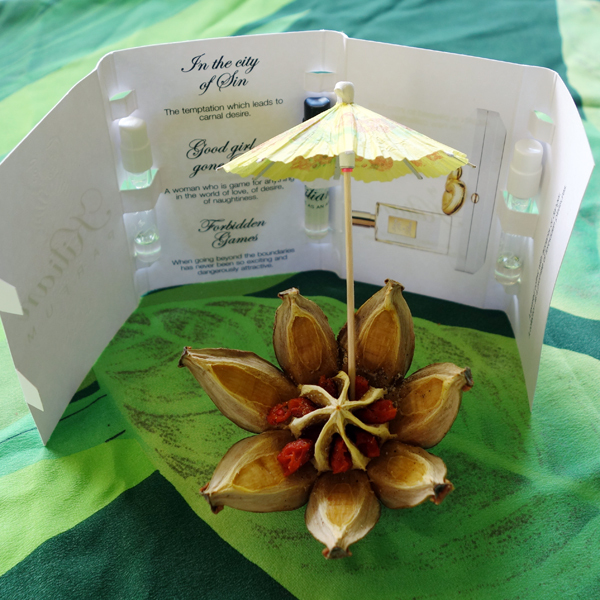 Do you want to know how many perfumes I had with me on Maui this year? Take a guess in your comment (without reading responses from others). As a prize for the closest guess without going over I offer a small bottle of the custom blended oil perfume, with the story of discovering which I started this post. After coming back from the trip I contacted the perfumer who makes it and we’re trying to work out the ordering process (it is a very small company). I don’t have it yet so I have no idea if I like it on my skin but I thought that the story itself and the joy of smelling it during the flight were worth ordering two bottles – one for me and one as a prize for this guessing game. If there is more than one right answer I’ll let Rusty to pick a winner. The game is on until I publish the revealing post. Images: my own; new header is created from a gift picture I got from Asali (The Sounds of Scent) right after my first swim in the ocean. If you haven’t done it yet, check out her blog for wonderful illustrations to her evocative perfume reviews. This entry was posted in "Four legs good", A Postcard from Undina, Meeting People, Random Stuff and tagged Bronze Goddess, Estee Lauder, Hawaii, Maui, tropical fruits. Bookmark the permalink. Hawaii are great – especially when you have a luxury of a shower and, occasionally, AC. I also prefer to swim in warm water, in my middle age, so I’m happy you got the temperature you like. Welcome back! I’m actually glad to be back: I could use a day or two more on Maui but after that it would have been too boring. And I miss my cat Rusty. Nice vacation, Undina! Wonderful pictures and that kitty looks like a Felix look-alike. DNEM but I will take a wild guess and say 4! Oh and of course, your new banner is beautiful! It was a nice vacation but I made much less pictures than previously since we mostly stayed in the same area. A couple of times I wished I had my camera or at least my phone with me: I missed a couple of great shots but we didn’t want to bring anything to the beach – not to worry while swimming. I am going to guess 12 perfumes, because a dozen seems to be the minimum number I take anywhere. I am packing at the moment for a short trip, so decided to break off and go and count how many samples / decants I had put aside and go with that number. Ha – it is dead on 12! I loved many things otherwise about this post: the beautiful header by Asali, the flight attendant story, the rotating bottle of Bronze Goddess in the fridge. Hey, I am really impressed your ‘chamber maid’ cleans the fridge! Thank you, Vanessa! I felt a little bit like being you while writing about that vacation (you understand, I refer only to the broad spectrum of things covered in the post, not to the language – I can’t compete there :) ). With the cleaning lady (WP’s spell checker objected to the word before I published suggesting that “lady” was a biased word) I was surprised as well but after I re-confirmed it with my vSO that he hasn’t touched the box and I knew that with my mild OCD there was no way I could have done it myself, it was the only other explanation. The cocktail was good. I should probably tell its story in one of the future posts. Bronze Goddess is a very well traveled perfume, as I can see. The next time you go on a vacation you should make a picture of the bottle in that area. I have a picture of BG for each of the three vacations it went to. I could use a tropical vacation. I’m guessing you had 6 perfumes with you. Thanks for sharing the stories and pictures. I’m sure that almost everybody could use a tropical vacation! Lovely post and pics. You always have the best stories to tell. My guess is 7. Enough to give you a choice but not too many as they would need to fit the circumstances/weather. Though maybe that’s just me. Love Asali’s illustration for your header. Thank you, Tara, you’re very kind. Come back for the reveal post to see a full list of perfumes that made a cut. Undina, I feel honoured that you’re using the illustration as your header, so happy that you liked it :-) and I love how you managed to make it fit in the shape with the added text and colour. Thanks for sharing your holiday memories, it was very evocative so a little like being there too. Gorgeous photos and what a lovely story about the flight attendant. My initial thought was that you brought 12 perfumes, then I saw Vanessa answered that so I pick 11, since I don’t think you’d bring 13. Thank you, Asali. It was such a great gift! And the timing was just perfect. Now every time I look at it I think of that first swim in a warm ocean. So thanks to you the vacation will stay with me for much longer. As soon as I saw your new banner, even before I read your post, I had a hunch that it was drawn by Asali. I love it – it works beautifully for your banner! I’m guessing that in total you took 14 perfumes. My reasoning is that I’m guessing you were there for a week and wanted to have at least 2 choices per day. I knew that if anybody would recognize Asali’s work you would. I would say seven, as decants don’t take up a lot of room, and there might be evenings you wants something stronger and days you want lighter, so a variety across the board. I hope you list them by name, I am very curious as to which ones they were exactly and how they worked out. I definitely will list them all in the reveal post and tell how it worked out. Sounds like a wonderfully relaxing time. And clearly no competition for Rusty there, although the glowing eyes make a fun picture. My guess is 9 scents. With those glowing eyes that cat looked like a tiny monster. Rusty was well looked after while we were away but still I missed him. Too bad cats do not travel at least as easy as dogs. I have never been to Hawaii…mostly because it’s just so far from the east coast, but it sounds like heaven. Hmmm, I don’t see you overpacking on your perfumes, so my guess is 5. My guess would be 4. I happen to like that number. Sounds like you had a glorious time! It was a great vacation indeed. Those fruits were just perfect! It’s almost impossible to get that quality anywhere else – unless it’s close to where they grow. I always look forward to this part of my vacation in Hawaii. Hello Undina: love those photo-slideshows! 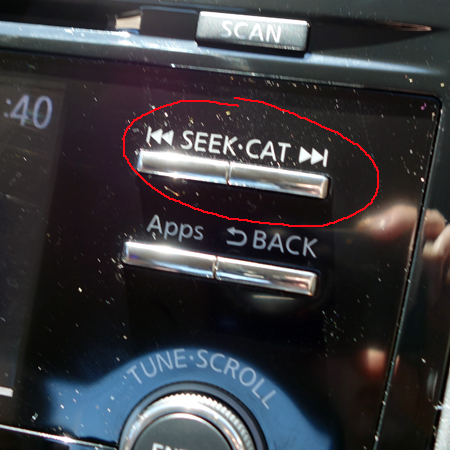 (and how perfect that you include a cat!) I’m guessing 7. I’m guessing 16 (Sprog’s age now) for travel bottles, samples and decants. I only took 2 roller-ball fragrances and 2 scented oils last time I travelled; they were great but too few for perfect bliss. The New Look banner is very charming – good to see Climat to the fore! Anna, it’s great to see somebody who recognizes my favorite perfume’s bottle. Two (well, even four) perfumes for a trip are definitely not enough! I’m going to guess 13 – for no other reason than it happens to be a lucky number for me. For a short weekend trip, I usually only bring 2 – 3 travel size/samples, for a week long trip I usually pack 5 to 6. I also like number 13 – despite of the common superstitions. Hi Undina. You’ve just given me such a craving for a spot of warmth. It’s turning chill now in the UK and the autumn so flattens me. I know it’s supposed to be cosy but the death of foliage is melancholic to me. I love Bronze Goddess. It really needs lots of bare skin so I doubt I’ll be using until next season. Wonderful choice for your hols. No need to enter me into the draw as I’m ambered-out at the moment. I’ve just bought some Youth Dew bath oil so that is fulfilling my rich oriental requirements. I am going to take a guess at your holiday fume stash though. I reckon 4, that’s what came with me on my last trip abroad. You don’t strike me as an outsize size stash type. On the opposite side of the spectrum, I could use some cool weather: it’s a heat wave here (above 30C) – and it might not be even Indian Summer yet! I agree that Bronze Goddess is a bare skin scent and it’s not one of those that can bring up memories of summer – you need an actual summer to rock it.